This year I went to the annual Heroes Convention held in Charlotte North Carolina. I was excited about going down and hanging out with my friends Brad and Stacy at their Battle Babies table. I was excited to fill in some collections too! I was looking forward to a fun filled weekend, but I didn't really know exactly what to expect, as this was the first time I had been to the show. I have to say it exceeded my expectations. This is the some of the most fun I have ever had at a convention. Everyone had a smile on their face and it was obvious everyone was happy to be there, and that is important to me! Every one had a positive attitude and tried to help and make deals and do sketches . . . whatever it was they did. The show was the 30th anniversary of the convention and because of that there were a lot of guests. Even Stan Lee came out for the show! Lots of Artists hanging out and drawing, doing commissions selling prints, signing. Most importantly though, they were talking. Talking to the attendees. Telling us about what they do, their art, What makes them tick. Some great conversations were had for sure. The Show Room Floor from above just before the gates opened on Friday! The interesting thing about Artist ally is that you have the old timers like George Perez and Neal Adams, right next to Indie Island with David Peterson and Andy Rutton! It was such a great interaction. All of these people who are influences on every body else just hanging out! Being able to meet some of these people who influenced my early life! The people who drew the comics I read and looked at. Earl Norem, who basically made paintings that I would stare at for hours, that had He-man fighting Skeletor! These people were important parts of my life and they were all there! I had the chance to speak to both Roy Thomas and Herb Trimpe, and they were both great! Herb told me why he preferred Shogun Warriors to the Transformers! People love to tell you things at this show! My Art print collection is much bigger now, but more on that in another post. The great attitude flowed right into the other part of the convention with the vendors. 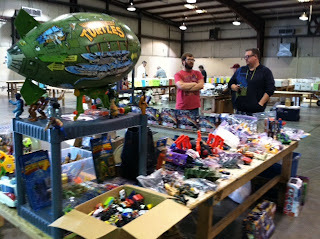 Hundreds of vendors set up selling Comics, toys, DVDs, you name it. every thing from anime to Doctor who, to independent stuff was represented. But the most important thing at a comic book show is, of course the comics. There were Millions of comics. Booth after booth of long and short boxes to go through. If it was produced it id represented here. There were comics selling for thousands of Dollars, and comics selling for 25 cents. no matter your budget, there was something for you. I filled in a few gaps in some collections myself! Comics were everywhere. It is a comic convention after all! There were other things though! The whole atmosphere of the convention bristled with energy. a very positive energy! Even though this was the most crowded year of the convention ever it everyone wanted to be there. I have been to other conventions where the crowd just became miserable, where you really get the impression that people would rather punch you than look at you! Heroes was not like that! In all of the square footage of the con you could really feel the love and respect every one had for every one else. Brad and his demented little babies! The real great part for me was getting to hang out with my friends Brad and Stacy over at the Battle Baby table. They did very well and the Battle Babies really shocked some people and pulled some people in. They are such a great concept! They also Shared a table with Brandon who did some fantastic Stained Glass pop art, and some GREAT screen prints! We had a great time all hanging out and getting to know each other. The city of Charlotte was no different in terms of being friendly. every where we went had friendly smiling people. the Food around the city was fantastic and I really enjoyed immersing myself in the culture of Charlotte for the small amount of time that we were not at the convention. One of the places we went was Phat Burrito. As you can see the convention did not stop when we left! The convention very much is a turning point. when I go to something like this it really makes me want to dive back into my creative projects. Perhaps soon you will see some of the things that will come out of this trip. Also there are a few changes coming to the blog because of deals made at this trip so stay tuned to see what happens! Thanks to all of those involved with making the convention possible. I will be back! I can't wait to be back! For those of you who want to experience a GREAT comic show, check out heroes I promise it will be worth your time! We stayed to help Brad and Brandon break down their booth! This was the sad part of the show when it was over and the room was becoming deserted! No post today! I am off to heroes. However, I hope to do a post or two while I am there to recap! I will at least be adding pictures to twitter via instagram, so check that out! As it does every week the League has called and I must answer it's call. even when that call is a bit abstract! 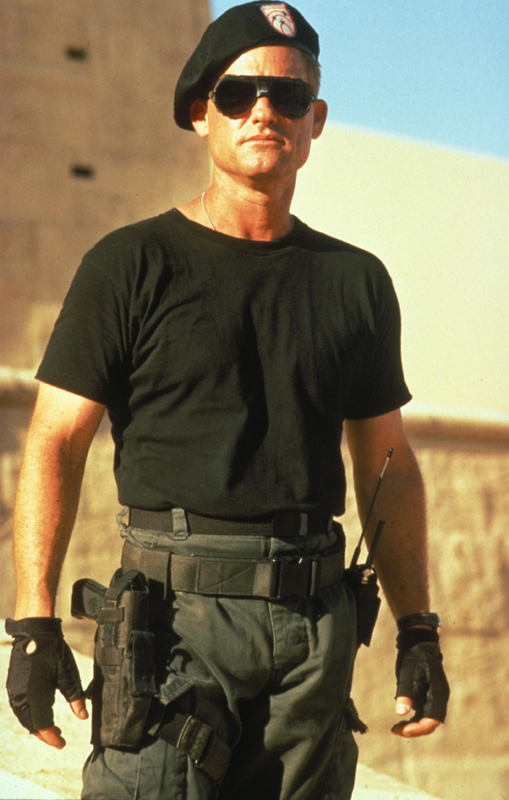 This week we write about Kurt Russell! I first became truly aware of Kurt Russell when I was in about 7th grade. I heard about Stargate. I loved the idea. I had always loved Egyptian mythology and for some reason the concept reminded me of Doctor Who. My Dad also was into this kind of thing and therefore he was easy to convince to take me. I think I was looking for something that was american that my friends would get into since I couldn't get them into Doctor Who. I remember telling them all about Stargate and trying to get them into it and even that did not ignite their imaginations. I think that that was the point that I realized I was surrounded by people who just didn't get it. I did go to see the movie and I loved it. To be honest it is the only thing that I have ever really cared about that Kurt has been in. 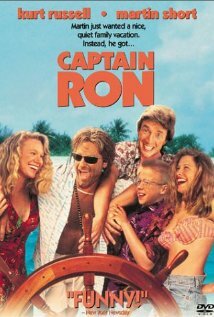 that is until recently when my wife sat me down to watch Captain Ron! It is something that is much different from the other roles he has been in! And I think that movie lets you know hoe diverse of an actor he really is. I actually got a whole new respect for him with that movie. I tend to not be a person who pursues movies because of a particular actor, but perhaps because it is a story that interests me. . . or more likely it has laser guns in it! Kurt Russell however does create a good case! See what other Leagers had to say about Kurt Russell here! Green Plastic Squirtgun gives us a top 10 list! That Figures educates us on Kurt! Flashlights are something to eat tells us about other things he likes! Collecting Nostalgia 001: Help me Jason Senn you're My Only Hope! After a fair bit of time the first episode is ready to go live. New Monster is pleased present the first real episode of Collecting Nostalgia! In this episode we profile Jason Senn a Star Wars collector from East Tennessee. 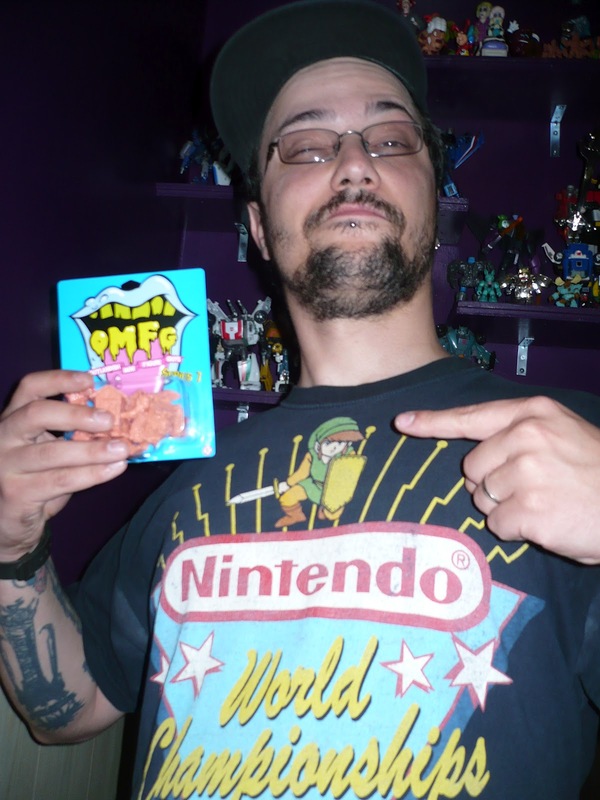 He tells us about his philosophy, his story, as well as some collecting tips. We tell some jokes, have some fun, and most importantly play with some toys! Enjoy the episode! I hope you enjoy it! We had a lot of fun making it! Heroes Convention! What should I look for? This coming weekend I will be attending Heroes Convention in Charlotte, NC for the first time. In a way I am kind of nervous about it. You see, I have been attending multi fandom events regularly for about 10 years, but in all of that time I have not been to a true comic convention. I'm not sure why but I just have never gotten the chance. A few years back I convinced my wife to go with me to Dragon Con, and that really isn't her thing, but she discovered the art room and really liked it. We both really enjoyed going around and talking to the artists and looking at the different art and prints. It was a lot of fun. From what I gather heroes is like a big version of the art room at Dragon! So we are loading up on thursday and making the trek. 5 hours. This is the longest I have ever driven to go to a convention, but I have never heard a negative thing about this show. A lot of my friends go every year so I figured I would be remis not to go. This is the 30th Anniversary of the convention, and the guest list is a who's who of the comic industry. There are both Mainstream and independent artists, writers, and creators. The list includes Stan Lee, Roy Thomas, Walt Simonson. The list goes on and on. I am really excited to have the chance to participate in this show this year. I think it will be worth the drive! The interesting thing is that I am only recently getting back into comics. I collected when I was a kid, and I enjoyed them. I still enjoy a lot of the characters and writers and artists. The comic convention is a new environment for me though and I want to come away with some insight. I want to know what I need to be on the look out for in comics. Old, New. . . from what I gather if its comic book related you can find it at heroes. The one thing I know I am looking for as I am always looking for it is old Jack Kirby stuff (mostly 70s DC) but especially the Hunger Dogs New Gods Graphic Novel. Aside from that I am looking for cool stuff. I love covers, I find them to really get my mind going when I need to be creative, so I am looking for cool covers as well! So, my friends, what should I look for, what should I come away with? Who should I meet? More importantly are any of you guys going? For those of you who may be going I want to give you a recommendation! My friend Brad Rader will be doing the first con appearance for his indie toy line Battle Babies! If you get a chance stop by his table and look at his creations. He will also have art prints available from the world of battle babies. It is a great fun line! At his table I will also have some cards and buttons for this blog, so if you are a fan of the blog please stop by and pick up some of the "Swag" I have created to promote "Life with Fandom. 80's Toy Awareness Month Contest Results! I tried my hand at doing my first contest this month with 80s toy awareness month. I have had some GREAT responses to this. I wanted to thank every one who submitted an entry. Every one of them was fantastic! I wish all of the entries could win, but in the end I only have one give away, although I hope to have more in the near future! It was hard and I am glad I decided to it by randomly selecting. In the end the OMFG figures will be sent to Jason, and he will be notified by e-mail about his win! Thanks to all those who took the time to send in a submission and even those who took the time to send in a submission even if they did not want to be in on the contest. I had some great submissions which I hope to post later this month! Ok for the third time this year I have found myself vending at a show. As I have described before my brother and I decided to try our hand at doing shows. We have bought up a lot of stuff and for the most part it is now self sustaining and has been a lot of fun. I have made a lot of great friends doing this and have had a great time. 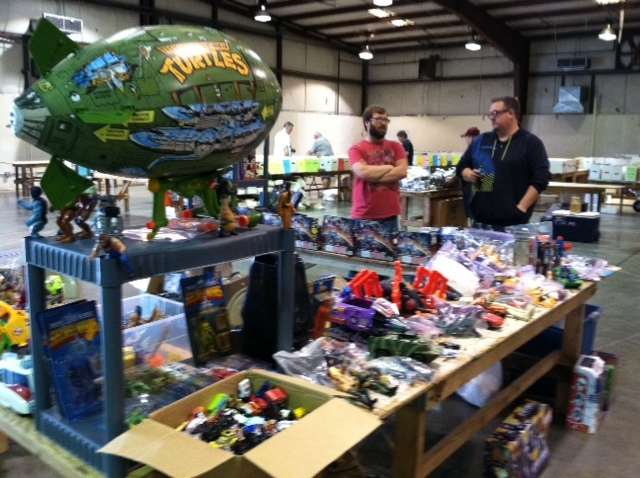 This week at the Collector's showcase in Johnson city was no different. We had lots of stuff this time and we decided to bring all of it. this time I even tried my had at comic books. I had a table full of them. We had out normal loose toys and out transformers. We have a little bit of every thing. The show was a small show but lots of different kinds of vendors there. A lot of comics, and lots of retail toys! It was a great time. Some of the other tables at the show! As always it was a fantastic show. we had lots of stuff and we sold lots of stuff we had a great time! we are planning on doing another one in July. I didn't buy anything at this show because I am gearing up for Heroes this coming weekend! It's Show Season Round Three! Prelude to the show! Well tomorrow I do another show. Once again I will be vending this is the fourth show I have done and it gets more fun every time. This time I am venturing to Johnson City TN to participate in the third Collector showcase event that is put on by the guys over at Purgatory Comics and Games. They put on a great show! I am always excited to see all of the people who vend as well as all of the people who come out to browse and buy. It is always exciting to see what is there at these shows! Our Table from the last show we did. At this show we are taking every thing, I am even venturing out of our comfort zone a bit and am bringing some comics. So this time at our table we will have a plethora of vintage toys, going as far back as the 60s and 70s, with everything from Mego, Transformers, and of course He-man! 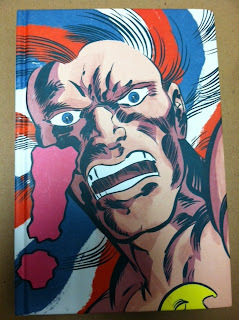 The comics range from Silver age all the way through modern age, so hopefully there will be something for every one! Also though, when I do a show in this area I am always invited to stay with My friends Brad and Stacy, and this is usually a highlight of the weekend! These guys have been such good friends to have since I have been involved in the collecting world. I have wrote about them a few times Here, and Here. So it should be a packed weekend. 80's toy Awareness Month Contest! Yesterday I was a bit out of pocket. Things have happened in the last week not limited to a leak into my living room that have made me be forced to miss a day. Unfortunately that was the last day of the 80s toy awareness month contest. So, I am extending the contest until this Sunday, June 17th, and I will announce the winner on Monday June 18th. So, you can keep getting those memories into me until the end of the weekend. I have to say I have had a great response to this contest, some great memories, from Getting GI Joe Play sets to playing with Other Worlds figures! Even some Atari Goodness thrown in there as well! So a big thank you to all of those who have participated so far it has been a joy to read your responses and have some back and forth with you! I always love to share my love for 80s toys! I am very excited to see what entries will come in between now and next Monday! Thanks again to every one who has been involved with the contest! The League: A Week With Reality Treasure Hunters! Once again the League has called and I am inclined to answer that call. only this week Brian over at cool and collected has really stepped it up. . . and perhaps out. this week we are to write about what reality treasure hunting show you would want to spend a week with. I had to think about this one. As I began to watch I realized that these guys were really good at what they did. Yes they sat on things from time to time, and occasionally they made a bad pick, but they seemed real and they knew what they did very well. They had an eye. I'm not a HUGE fan of the types of antiques they look for, but I am a fan of looking for stuff. I'm an amateur. I go to yard sales and flea markets and try to get good deals on toys so I can resale at shows, because I love going to shows. I don't think I would ever be so bold as to do a cold call to a person's house and ask if I could buy stuff from them. But it would be fun to experience it. I say all of that to say this: If I could spend a week with someone from a show like this it would be Mike and Frank from American Pickers. Just from watching the show I have learned lots and lots, I can't imagine what I would learn if I actually rode along with them. Perhaps I could even talk them into looking for some toys! Strangely this wasn't as painful as it should have been! Check out some other League Bloggers and see what they have to say on the topic! 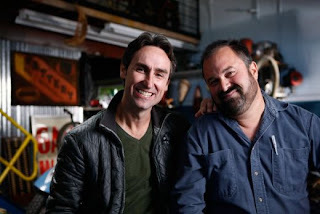 shezcrafti has some suggestions to make American Pickers even better. Some of my favorite 80s toys are the smaller scale Kenner lines. After the success of their Star Wars line Kenner began to make their figures even smaller with lines like Mask, and Sky Commanders. One of the last lines that the company did like this was Bone Age. The company was obviously taking a cue from the success of Dino-Riders from Tyco. Bone age was a line with small (about two inches tall) cavemen that rode on the bones of dinosaurs. The fossils are impressive. They can be taken completely apart and reconfigured in any configuration, and can even be combined with parts from other dinosaur fossils in the line. They each have a main form, which is the dinosaur they represent, and most of them have a "battle form" that is more of an attack vehicle. the Triceratops' horns act as missiles and most of the other dinosaurs have some sort of projectile too. This is one of the great features of 80s toys. . . projectiles! Kids loved things that shot. . . or at least toy companies thought they did! These are not toys that you see very often. I have never seen one at a show, but you can see them on e-bay from time to time! They don't go for a ton of money and you can get some good pieces for about $30 or less. It is a line that is worth looking at especially if you like the other smaller sale lines that Kenner released in the 80s such as MASK or Sky Commanders, this finishes out that trilogy quite nicely! If you get a chance this is a line to pick up for sure! Don't for get to share your 80s toys memories during 80s toys awareness month! Also remember sign up for the competition and win some OMFG series one figures! 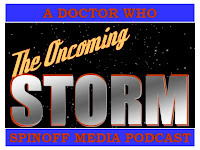 One of the many projects I am involved with is a podcast called The Oncoming Storm. It is a podcast about Doctor Who Spinoff media, such as novels and audios, we don't talk about the TV show as a main topic, but we do some comparison from time to time! It is a fun podcast. My co-host, Josh Wilson and I get the chance to talk about things we really like, and something really cool happened this past Saturday. We got a chance to speak to Jean Marc Lofficier. Jean Marc Lofficier has been a name I have known for many years. He has written many of the most important bits of Doctor Who non-fiction, such as the Program guide and the Nth Doctor. Of course his work doesn't stop there, he has written about Star Wars, Star Trek, the Twilight Zone. He has even written for DC and Marvel Comics. For me, talking with Jean Marc was magical. This is a man who, in a way has been a hero to me since early in my fandom experience. His books are some of the things that took me from liking a show, to being involved in the fandom around it! So getting the chance to speak with him and ask him questions was great, especially since he lives in France. It was really cool that he gave his time to us for such an interview! I don't want to give too much about the interview away because I want you to listen to it, but he gives some great insight into the early days of Doctor Who nonfiction and the feelings about it at the time, as well as pop-culture and Sci-fi non-fiction as a whole. This episode of the podcast will come out in two weeks, in the mean time you can catch up on some of our other episodes if you are interested in Doctor Who fiction or non-fiction. 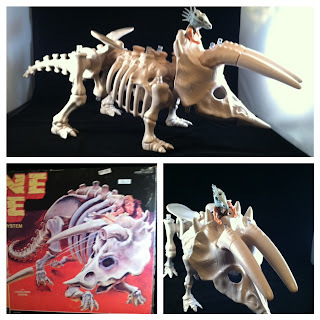 Its 80s toy awareness month and I am going to post my first 80s toy to be aware of. This is Prime Evil from the Filmation Ghostbuster's line. These were the other Ghostbusters. These guys were the ghostbusters I grew up with before I found out about "the Real Ghost Busters" They were zany and goofy and a gorilla followed them around. Beyond that everything in their house was haunted and talked to them. The idea that all ghosts weren't bad was a cool concept. This was a true Cartoon! Prime Evil here, was the villain. He was surrounded by lots of incompetent ghosts who could not do what he told them to do (so pretty much like every other filmation villain.) 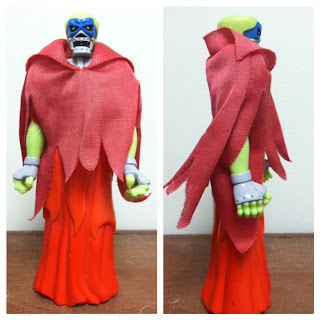 The toy actually does him a decent amount of justice with his flowy cape robe, and the colors he has. The line was produced by Schaper (but there are some figures with the tyco brand on them.) The toy line is an odd one because typically there is not a ton of value in them, but they are hard to find. This is the only one I have ever seen at a show. You can find them from time to time on e-bay but the prices are usually a little higher. The line was colorful and really fit in with other toys in the 80s. I remember always wanting some of these toys but never getting a hold of them. The line was based on a cartoon and most of the characters from that cartoon were represented. If you get a chance take a look at some of these toys they are pretty fantastic! Also don't forget about our contest for 80's Toy Awareness Month! After a week off the league has called again and I must answer! This week it is a little less involved but still not easy! What are your top 10 favorite movies? Wayne's World - one of the first more grown up movies that I actually got. Plus I really like Dana Carvy! Empire records - There was a summer (probably 1997 or 98 where I rented this movie and probably watched it 15 times in one weekend. I don't know why but it just kind of spoke to me! and it still does! Bill and Ted's Excellent adventure - I remember begging my mom to take me to the theater to see this movie, and I never regretted it . . . but I think she does. For me it was about time travel and it was an obvious riff on doctor who. . . so I loved it! Flash Gordon - What is not to love about this movie. . . plus Brian Blessed as a hawk man! Monty Python's search for the Holy Grail - Saw this movie for tghe first time when I was in 8th grade, after all of my friends talked about it so much. Also a life changer. I got a VHS copy at media play and the rest is history. . . there is a reason it is one of the most quoted movies ever! The Star Wars Franchise - Really I should just put star Wars. I love the three original but the first one has always spoken to me the most. The early days of this movie were some of the best things out. the marvel comics I think made it a much more exciting story than what we eventually got. this trailer is really interesting too. . . it really reminds you that they really had no idea about what the movie really was! Masters of the Universe - A favorite as a kid for obvious reasons although at the time I didn't get the movie. Actually until recently I didn't get it! Now that I know a bit about Jack Kirby and the new gods it makes a lot more sense. I would recommend you checking it out again if you haven't in a while. Transformers: The Movie - It was such a sad experience, to see optimums prime die. But it has a ton of rewatchability for me. a really good movie. . . so much better than the bay stuff! Teenage Mutant Ninja Turtles - I saw the trailer to this movie at another movie and I didn't stop talking about the turtles trailer. . . I still quite like it! Mystery Science Theater 3000- This is a movie I watch over and over and I still laugh at all of the jokes! It was a n odd choice to get a movie but it worked! 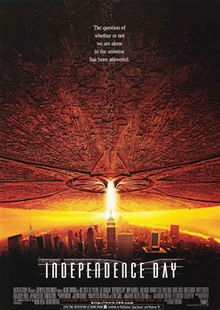 What are your favorite movies. Check out the League and tell us. Watch this spot for other League posts! Collector Friends and Holy Grails! I have been wanting to do this post for a few weeks now, and I a, finally getting around to it! Several weeks ago I wrote about going on a visit to my friends Brad and Stacy's house. These guys were very kind in letting me stay with them while I prepared for a show. One of the greatest thing about having collector friends, though, is that they know what you are looking for. Because they are collectors, they understand what it is to be a collector and may find things that the normal person would pass up, or think the price is outrageous. A few weeks ago I got an urgent call from Brad. I wasn't in a situation to answer the call, so he gave me a text. He had found something that I had mentioned once or twice to him that I wanted. Hulk 181. I called him back and told him to try to get it if he could get it down a bit. And he did! He got a Hulk 181 for me! 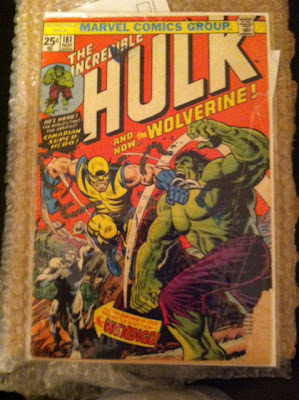 I'm really not a Hulk fan or even a wolverine fan any more, but I always wanted that issue. It was the one comic I was willing to pay a large sum of money for. I have been looking for a good display issue. Didn't have to be in great condition, I just wanted it. Brad and Stacy found it for me and I am grateful for that. You can find Stacy on twitter @geeky_vixen and Brad makes Battle Babies, one of the coolest indie toy lines around! If you are going to be at heroes con in North Carolina later this month be sure to go by and pick up some battle babies! 80's toy awareness Month and a CONTEST! I love the toys of the 80s. Having grown up in the 80s I still think they are the best, there has never been an era in the toy industry as inovative as the 80s. In memory of 80s toys I am calling the month of June 80's toy awareness month, here at life with fandom. There are lots of great 80s toys and many of them that you can still find easily. I propose sharing this enthusiasm with my readers and maybe some of those who do not read this site! Throughout the month of June I will be posting thoughts of different 80s toy lines (as if I don't already do that!) and hopefully some pictures as well. Heck, I might even finally get around to doing a video or two. Of course I don't want to hog my love for these toys, I want you, the reader, to write about your favorite 80s toys too, so much so that I want to provide an incentive. All you have to do is send me an email and tell me about your favorite 80s toy, or a favorite memory of an 80's toy, and you will be entered to win a set of October Toys OMFGs. Though they are not from the 80s these toys are very much in the spirit of the 80s so I feel they are an appropriate give away! I will be posting some of these memories on posts here at lifewithfandom.com so we can share the memories! The Contest will begin today and will end on June 14th, the winner will be announced on Friday June 15th, so get those 80s toy memories flowing and start writing! Can't wait to read about your favorite 80s toys! Also during the the month of June I encourage other bloggers to write about 80s toys, and talk about what you love about them, or even what you hate about them. . . just write about them! Never Fear Collecting Nostalgia is back with our first full episode. . . Almost. Here is a trailer for the the profile of Jason Senn! We are excited to show off his great Star wars collection. The complete episode should be out soon but in the mean time enjoy the trailer!